Sure, YouTube might be great to just mindlessly browse through when you're bored — but when you need to create engaging, captivating presentations that effectively capture your audience, you need something other than video. Powtoon helps you create beautiful, professional presentations from a series of drag and drop templates that you can customize in minutes — and it's perfect for all industries, whether that's business, education or even your own personal business pitch. Powtoon is one of the top video creation platforms in the world, used by more than 25 million people including Fortune 500 companies like Coca-Cola, Costco, Cisco, Starbucks and more. Users can create amazing videos without any design or tech skills — the platform includes the use of a full animation studio, including access to millions of royalty-free assets, royalty-free HD video, soundtracks and images that you can use without fear of copyright. There are hundreds of templates you can easily and quickly customize through drag and drop — whether you're developing an onboarding presentation for HR, a training video for your marketing team or even a fun video to celebrate a friend's anniversary. You even get commercial rights to what you create, with full privacy control, Facebook Ads Manager export and much more. 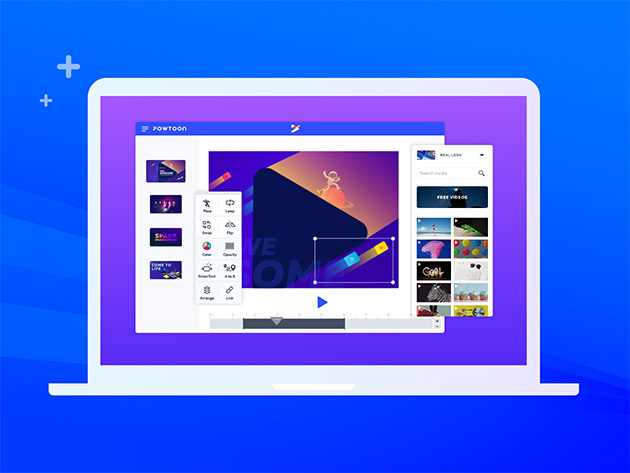 Use this comprehensive platform to take your video creation to the next level: usually, this one-year subscription to Powtoon is $192, but you can get it here for $139.99.